The new 101-bedroom Moxy Berlin Humboldthain Park hotel has opened its doors with interiors by JOI-Design. 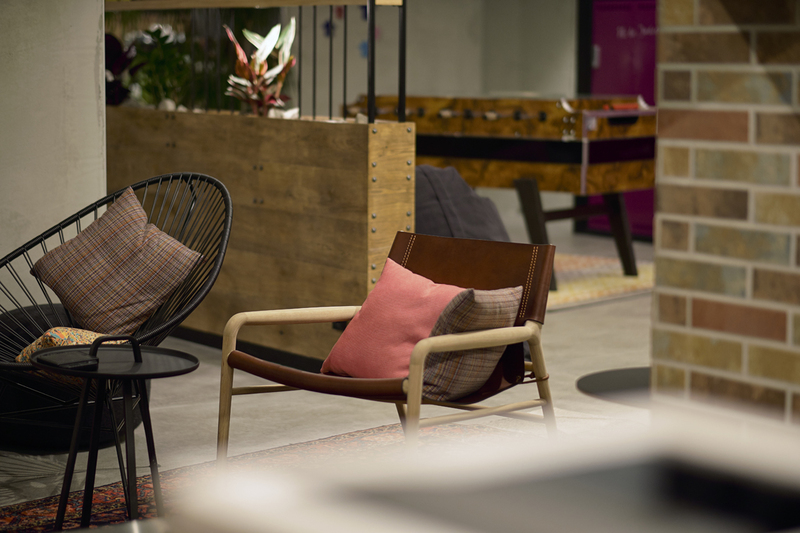 Reflecting the brand’s ‘central, affordable, eclectic’ ethos, the designers have created an easy-going open-plan environment as much a casual co-working space or a lifestyle club as a cosy hotel. Natural wood features widely in the interior scheme along with bold and varied colours and materials, casually-placed seating and furniture, and exposed walls. This is a hotel where guests feel as if in their own or a friend’s living room! Borders dissolve in the public areas where guests are encouraged to move around freely. Every zone is perfectly, and at the same time playfully, equipped for its intended purpose. JOI-Design focused on creating an uncomplicated atmosphere where guests are able to do their own thing. Rather than being in a traditional central area, the reception desk has been discretely worked into the background. When entering the hotel guests are met by casual, friendly hotel staff at a coffee counter where they can enjoy a cappuccino whilst their room key is brought over. Next to the entrance awaits an inviting lounge offering guests comfortable leather pillow seating surrounded by colourful Persian carpets and lots of green indoor plants. 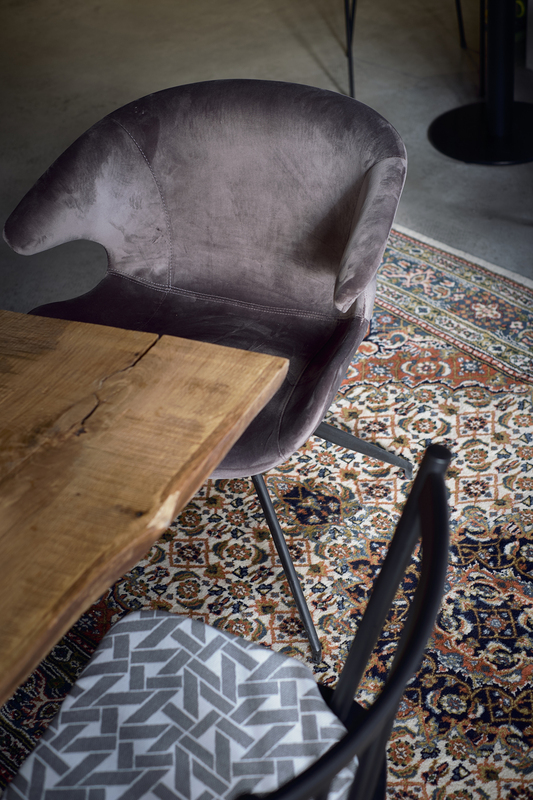 This space is a perfect haunt designed to hang out and play a board game or sit back and watch guests coming and going. The hotel’s welcome zone has been designed as comfortable living room space with different types of seating including poufs, lounge chairs and beanbags, all flexible in their nature so these can easily be re-arranged. Light, neutral colours are contrasted by a dark ceiling with metal pipes and other exposed elements. Concrete surfaces are sprayed with graffiti telling the story of the building’s history. A football table encourages guests to engage and get together and in an unusual twist, a digital ‘Moxy guestbook’ is displayed on a flat screen above the zone entrance where guests can upload their mobile picture of a football game or a night in the bar. The welcome zone flows into a quiet area with an open library and a plug-in zone, that offers computers, sockets, USB ports and fast internet. 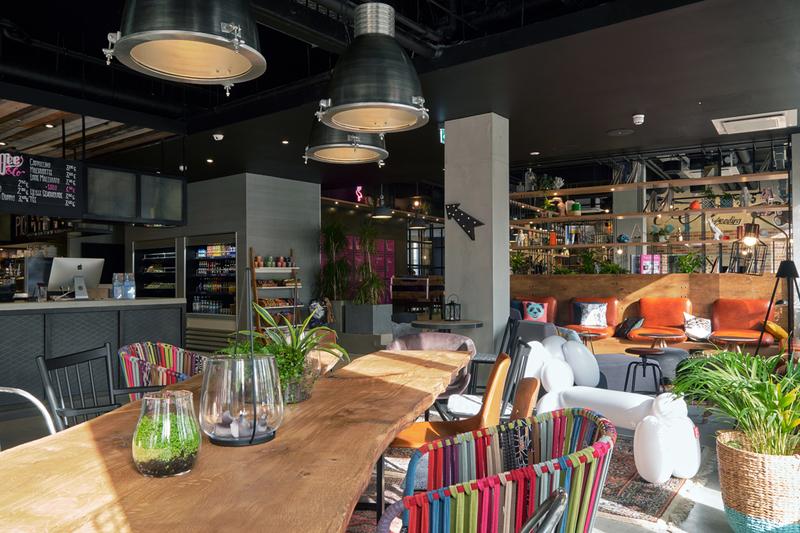 Designed to appeal to different types of guests, the space allows business travellers to check up on email whilst leisure guests can delve into one the guidebooks to check up on what Berlin has to offer. The city of Berlin has been playfully weaved into all the public areas, with both historic and fun facts to sightseeing ideas. Recognising the need for some guests to work by themselves, the hotel required quiet spaces which the designers have translated into two separate ‘think tanks’ as a key part of the public areas but away from other guests. Next step: culinary well-being. Situated right behind the coffee counter as guests enter the hotel is a buffet with six stations offering a simplified approach to dining; freshly made light dishes and drinks from the bar and no matter when hunger strikes, a 24/7 retail experience featuring prepared items as well as grab- and- go products. Once breakfast is finished, its accoutrements are neatly hidden behind minimalist steel doors. Meals can either be enjoyed on a long community table with other guests or on small tables for a bit of privacy. In contrast to the lively, sociable public areas bedrooms more minimalistic featuring natural colours and materials to allow guests to decelerate and relax. 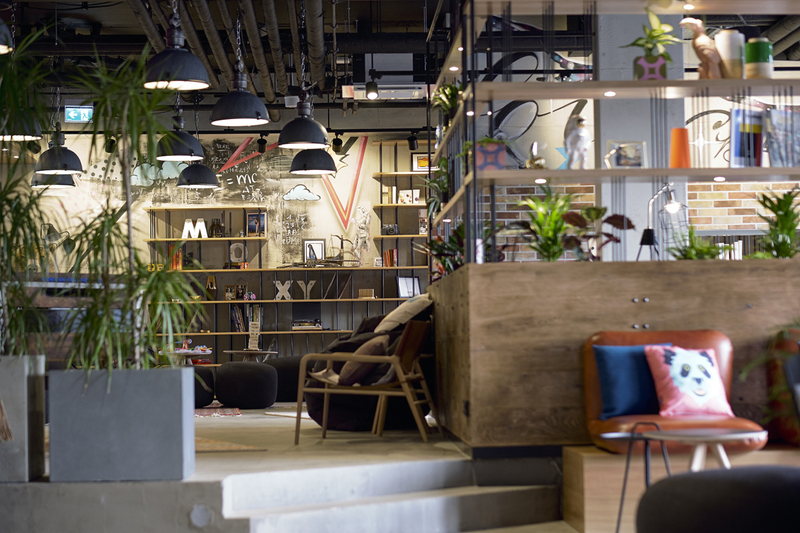 Moxy Berlin Humboldthain Park is a centrally located, affordable and mischievous creative space which will appeal to guests with a youthful mindset, seeking a place to hang out and socialise, as much as a place to stay. 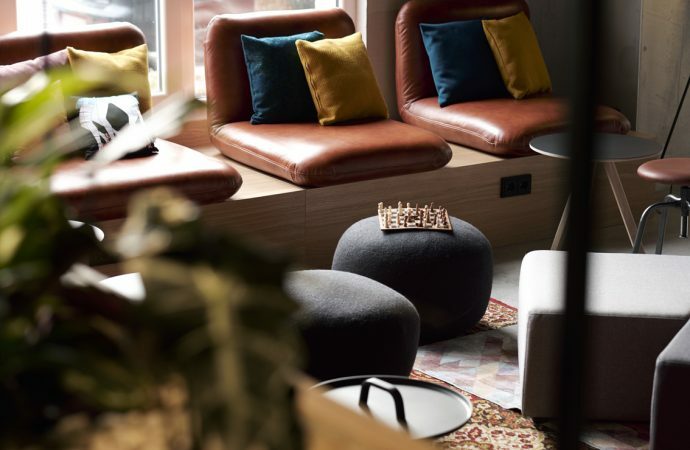 This up and coming young hotel brand’s concept has been interpreted in a playful way through quirky interior design features such as the city’s famous mascot, the Berlin Bear (Berliner Bar). This cool and laid-back bear appears in various forms throughout the public areas greeting guests in the form of graphic street art graphics, as a sculpture and in small decorative details like the cushions in the lounge.